An ottoman is a stylish and functional piece of furniture that can really bring a whole room together. They are great if you need a bit of extra seating, want a place to put your feet up or add more living room storage. When picking the right ottoman for you, first decide you want to use it for, and then decide what shape would suit the room you want to put it in. Square and cube ottomans tend to fit nicely in living rooms as a central feature which can be framed nicely by sofas. Rectangular ottomans are best suited to bedrooms and hallways as they tend to be the perfect length to go at the end of a double bed, or to fit nicely in a long, narrow hallway. Then you can consider what fabric you prefer. Ottomans are items of furniture that are frequently used, so take into consideration if they are going to be in a living space where pets and children might get their mucky paws on them. Think darker colours or leather for easy cleaning in communal spaces, and save lighter, softer fabrics for the bedroom where they are likely to wear better. This Rose Mist ottoman is a popular choice of bedroom storage which has plenty of room for all your spare linen and towel. The ottoman itself is sturdy with wooden legs and has an easy-to-lift lid that makes it easy to pack stuff away. Those who bought this item love the colour, as the dusty pink lends itself quite nicely to neutral decors and its handcrafted detailing on the legs is quite popular among those who favour the shabby chic trend. The upholstered finish is soft and its curvaceous arms make this ottoman more than just a storage place, but a place to perch at the end of the bed or simply add character to a room that is missing something extra. Looking for an ottoman for a traditional living room? then look no further than this dark green and mahogany leather ottoman. Its rectangular shape makes it easy to style in a room and could make a nice central feature if you also have leather sofas. The darker colours are favourable for communal areas of the home, as it’s less likely to show up marks and stains, and is easy to wipe clean. There isn’t any storage in this ottoman, but it’s well-padded which means you can expect it to be a comfy place to rest your feet after a long day. Hallways and spare bedrooms can often end up getting cluttered with coats, shoes and other items we don’t have space for anywhere else. However, with this storage ottoman you can keep everything out of sight and add a stylish piece of furniture into the mix instead. Users have said this ottoman has plenty of storage inside and the soft close lid adds a nice touch when getting things out. It’s upholstered well but is said to not be the comfiest, so if you’re looking for an ottoman to use as seating, check out one of the leather ones on our list instead. The greyish/blue colour lends itself well to communal areas as dirt and scratches won’t be as obvious on this textured ottoman and polyester is much easier to clean than some other materials. If you need lots of storage, then this ottoman could provide just what you need. Its neutral colours are a popular choice for many interiors and make it a versatile piece of furniture for any room in the house. Many have used it at the end of their beds, but as it is quite long you may find it to be a bit of a squeeze in smaller rooms. It’s not the comfiest to sit on, but its soft, curved edges certainly make it aesthetically pleasing to look at as well as functional for keeping rooms neat and tidy. If you’ve got a large space that looks like its missing something, then this plush ottoman could be just the thing to bring your interior together. This luxury upholstered ottoman from Wayfair doesn’t have any storage space but you can expect it to make a comfy foot stool for when you’re relaxing in the lounge. It is white, however, so households with children and pets may struggle to keep this clean, but for adult-only zones such as a conservatory or home office, you may find this is the perfect way to accessorise a room. You can really make a statement with this oversized ottoman from MADE that mixes both traditional luxury styles with modern minimalism. 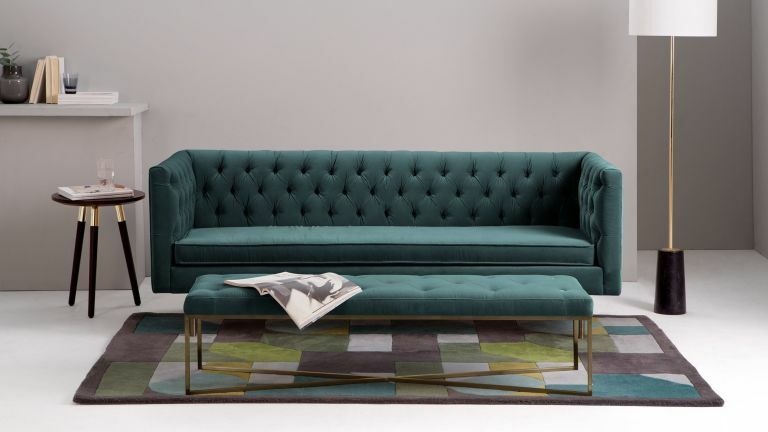 The upholstered velvet top with button creases is both comfy and stylish, and the emerald green colour is contrasted nicely against the antique brass legs. This ottoman is quite narrow and long, which means it could work equally as well in a hallway as it would in your living room. Want more living room inspiration?